Memorial service for Margaret Arliene Ferguson Alford, 86, of Alto will be held at a later date. Mrs. Alford died March 16, 2009, in Nacogdoches. 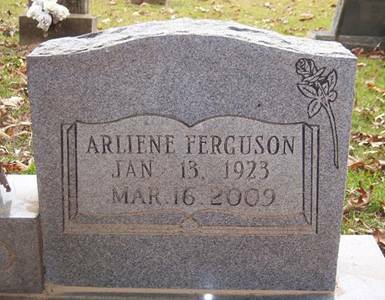 Born Jan. 13, 1923, in Lufkin, she was the daughter of Arlie E. and Addie G. Risinger Ferguson. She was retired as a school teacher from Hemphill ISD. She was married to Hollis W. Alford, and he preceded her in death. Survivors include sons Roy Alford of Montgomery [AAFA #0208] and David Alford of Alto [AAFA #0615]; one grandchild; and eight great-grandchildren. AAFA NOTES: SSDI records confirm the birth and death dates of Arliene Margaret Alford (SS# issued in TX), last residence Alto, Cherokee Co., TX. We included the obituaries of her husband, Hollis Wilton Alford; and her grandson Mitchell Lee Alford in Texas Obituaries.